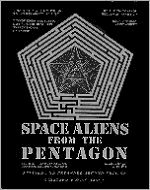 This book (formerly entitled Space Aliens From the Pentagon)in its third edition, is the first to reveal Nikola Tesla as the inventor of the flying saucer, and to expose a BIG LIE mind control hoax copied from the Third Reich, covertly implemented through "national security" means, to perpetuate the coercive monopoly of a corporate-state elite. By stealing, concealing or suppressing advanced technology, our continued dependency on archaic petroleum and nuclear technology is insured. To this end, flying saucer technology of relative simplicity and phenomenal potential was stolen from its inventor, Nikola Tesla, and has been concealed from us for over 50 years. In 1953, Lyne and at least seven others saw a flying saucer at a close range. Lyne studied its behavior, discovered its secrets, and presents this book, representing over 45 years of research, complete with a set of simplified plans to build your own saucer. The obvious BIG TRUTH- that flying saucers are real, man-made electrical machines, and that there are no aliens on earth- is being ground to pieces between TWO BIG LIES, both essentially one big lie, covertly disseminated through the media and various "front" groups and publications, by teams of Ph.D.s employed by the O.S.I. ( Office of Scientific Intelligence, CIA). The secret government orchestrates both sides of the sham debate between covert agents, posing as "UFOlogists", and official government spokesmen. The UFOlogists' (the O.S.I. 's) "alien" scenario conceals the man-made nature of flying saucers by depicting them as "alien crafts", involved in visits to earth, abductions, and collaboration with our government, which they allege is concealed by a "government cover-up conspiracy". Officials conveniently provide false credibility to these lies by their irrational behavior, or silence. Contains much never before published information, including photos of a celestial guidance system from a WWII-vintage Nazi "Kreisel Teller" ("Gyrating Plate"). NEW THIRD EDITION just released! Is there a "Secret Physics" with a different set of rules that have been hidden away from us earlier in this century by a powerful elite who fear the technology based on it will strip away their power and wealth and liberate us from their grip? Dynamite comes in small packages, and this little stick of scientific dynamite blows apart pseudo-scientific myths and instills the truth. Documents Nikola Tesla's discovery of electrostatic-propulsion in 1894. New Third Book just released! Foreign surface mail - $14.00. NOTE: Both of these books are in stock and available from William Lyne. inform us via E-Mail or phone..